As you might know, I recently spent a few days on Sanibel Island in Southwest Florida, just over the causeway from Fort Myers. 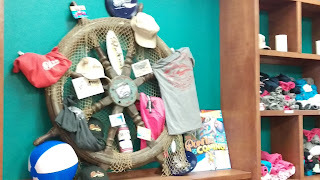 I had heard about the beaches and the seashells and the gorgeous color of the water on the gulf side. 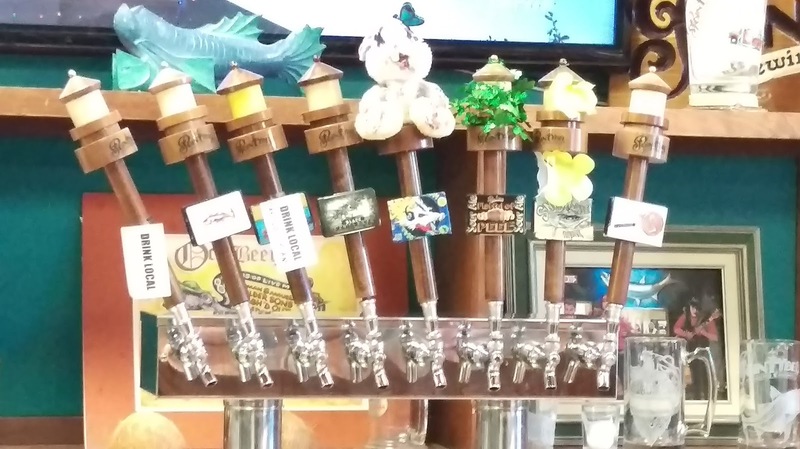 And, lately, we have been hearing more and more about the beer and new breweries in this part of the state. 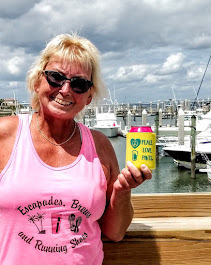 So, in true journalistic fashion, this beachgirl did some research: Yes, I had some "tough" days at the beach looking at that water and walking the seemingly endless stretches, all while watching the shorebirds and investigating the abundance of seashells. 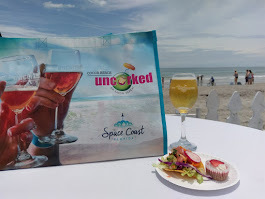 I even came up with some beach-and-beer photos that I posted on social media sites (that all takes work, y'know). 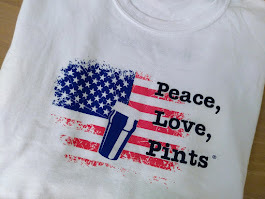 But, at the end of the day, you just need a beer! 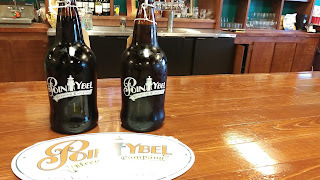 So, on one particular day, I headed over the causeway toward Fort Myers and onward to Point Ybel Brewing Company. It was a fairly easy drive (hey, I'm on vacation). The brewery is located in a small shopping center and is visible from the street. 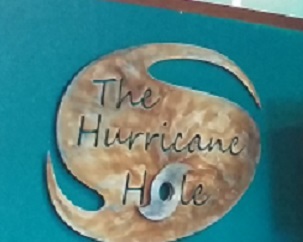 So, enter the tasting room, nicknamed the "Hurricane Hole." Here you'll find a large open room, with a bar along one wall and picnic tables for seating. 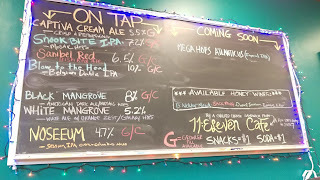 The large chalkboard on the opposite wall lists the beers on tap. There's a stage for live music and a few bar games. 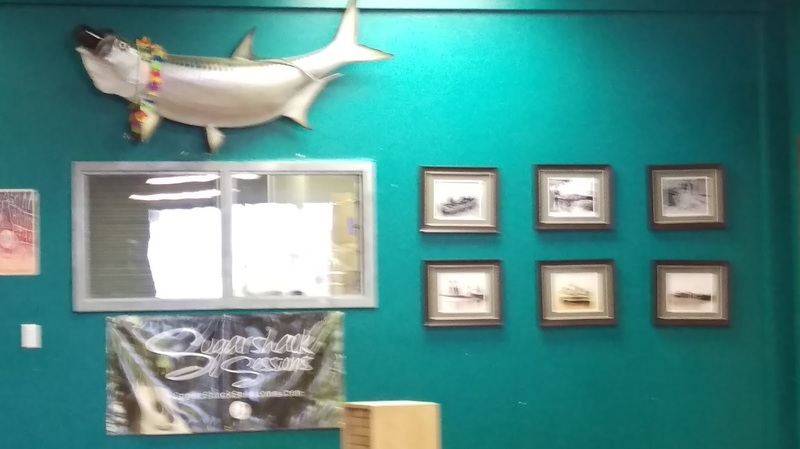 On the walls are photos and artwork about fishing or island life. 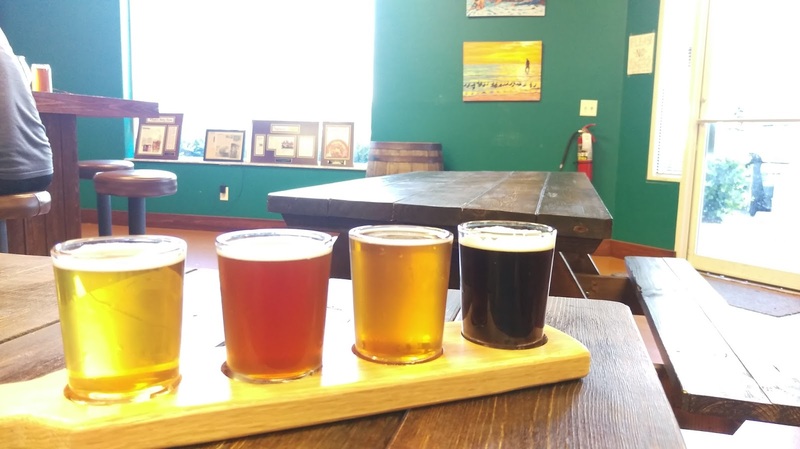 In fact, the theme of the brewery is tropical, revolving around the islands, from the names of the beers to their flavors and ingredients. 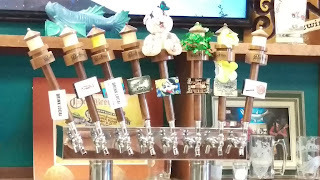 Although the brewery offers seasonal and rotating beers, it also has a set of core beers that you are likely to find on tap most of the time: Black Mangrove American Dark Ale (7.2%), Endless Summer Pale Ale (5.5%), Sanibel Red Island Ale (5.6%), Snook Bite IPA (7.0%) and Yay Sanibel Saison (6.5%). 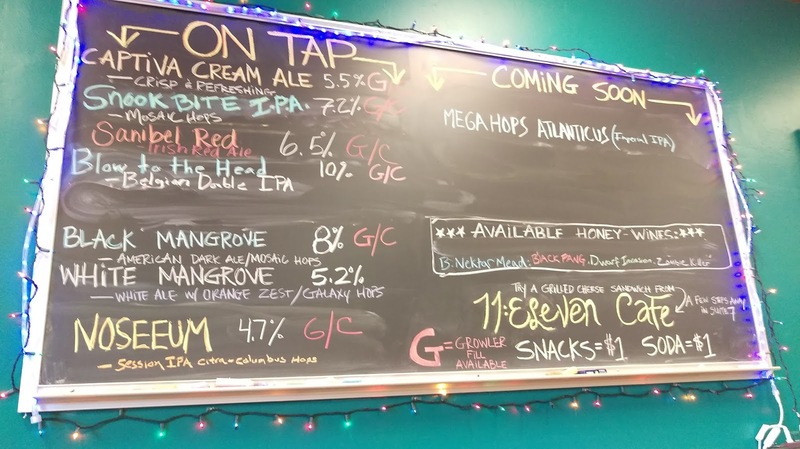 There were a few additional brews on tap this time around: Captiva Cream Ale (5.5%), White Mangrove White Ale with orange zest and galaxy hops (5.2%), and Noseeum Session IPA (4.7%). 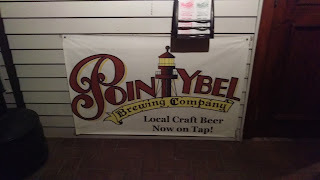 Point Ybel Brewing is a small-batch system, having a 4-bbl brewing system, with five 8-bbl fermenters. That's a pretty good amount of beer to be brewing! 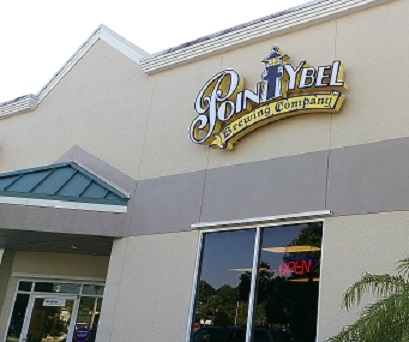 And, this is a young brewery, only having opened in December 2013. The owner, Walt Costello, is a former fishing guide and homebrewer. That's a pretty interesting combination of a background, which explains the theme here. 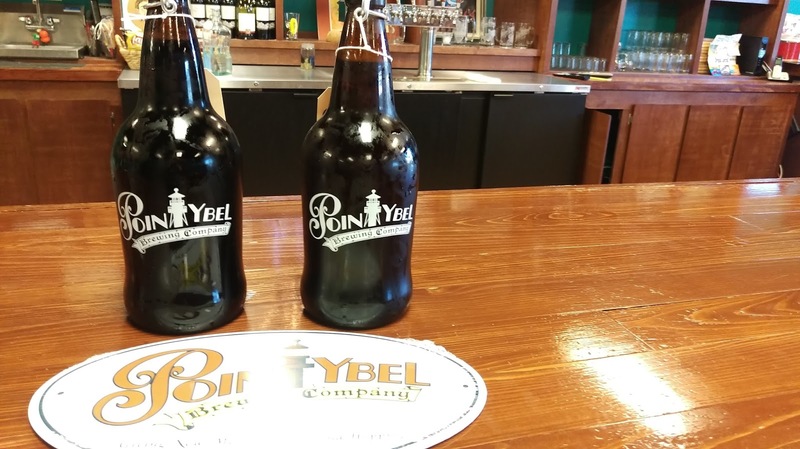 Apparently, the initial thought was to open the brewery on Sanibel Island (named after Point Ybel), but because the local ordinance doesn't permit producing beer for distribution there, the current site in Fort Myers was selected. 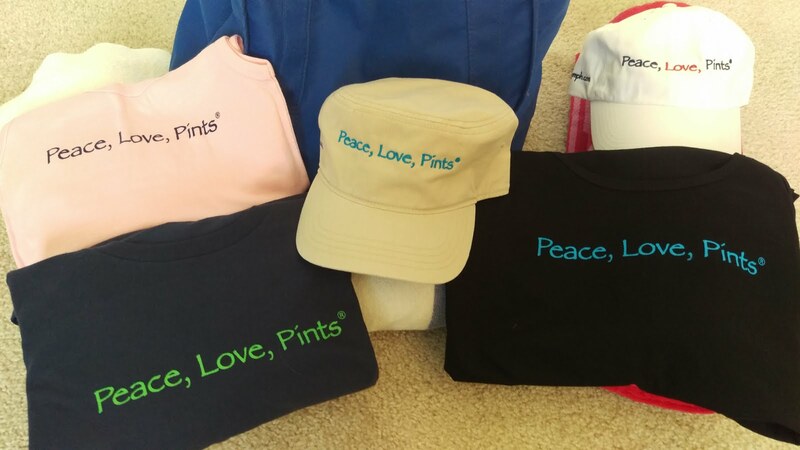 And, what's the beer taste like? As usual, I started off with a flight so that I could taste more than one! First up: Captiva Cream Ale. I like cream ales, generally, as they are easy-drinking and crisp. Well, whaddaya know, the board says "crisp and refreshing." And, this one is just that. It's clear, light gold in color, with slight malt on the front; a cream ale with some substance. Just a good-drinking beer that I liked quite a bit. 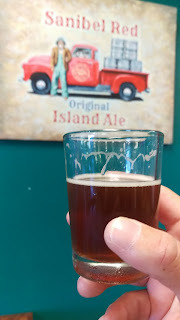 The Sanibel Red Island Ale (Irish red ale) is a definite winner in my book. You get it all in this one: malty, caramel, toffee, with some nuttiness; very smooth. I thought this one is one of the best red ales out there. Indeed, I got a full pint of this one too! 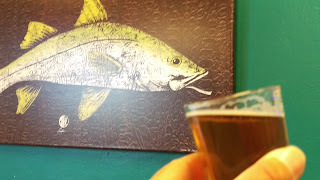 The Snook Bite IPA was brewed with mosaic hops, and the citrus/pine notes really come through. 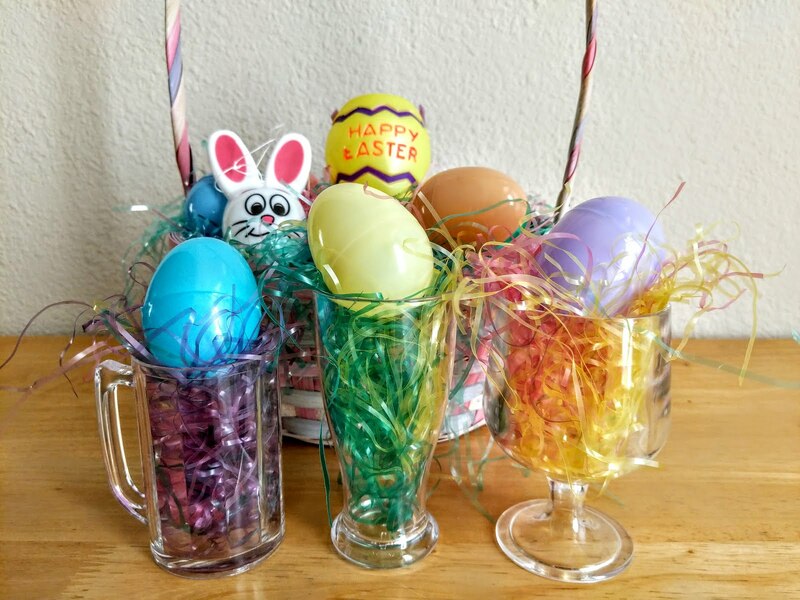 It has a fair amount of hoppy bite. Although this isn't a west-coast style, you IPA hopheads who like the hoppy citrus will want this one. Which brings me to the Black Mangrove Dark Ale, this one also with mosaic hops. This is one of my favorite styles typically, and this one delivers. It's roasty with a bite. I liked it so much, I got a growler of this one to take back. 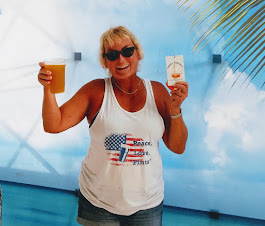 So, as you can tell, I liked the beers here. If you live here, are on vacation, or just traveling through the area, it's a definite stop. And, the Point Ybel Brewing beers are in distribution to local bars and restaurants. 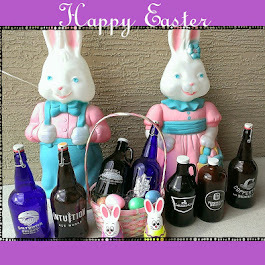 The brewery/ tap room is located at 16120 San Carlos Blvd. in Fort Myers. 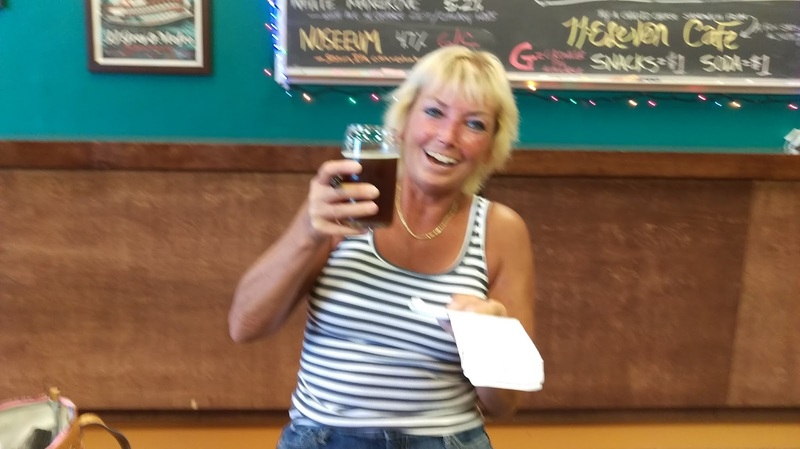 The tap room is open 7 days, and live music is featured. Check it all out and get updated information via website, or on its Facebook, Twitter and Instagram social media sites. And, that's it for this time around. 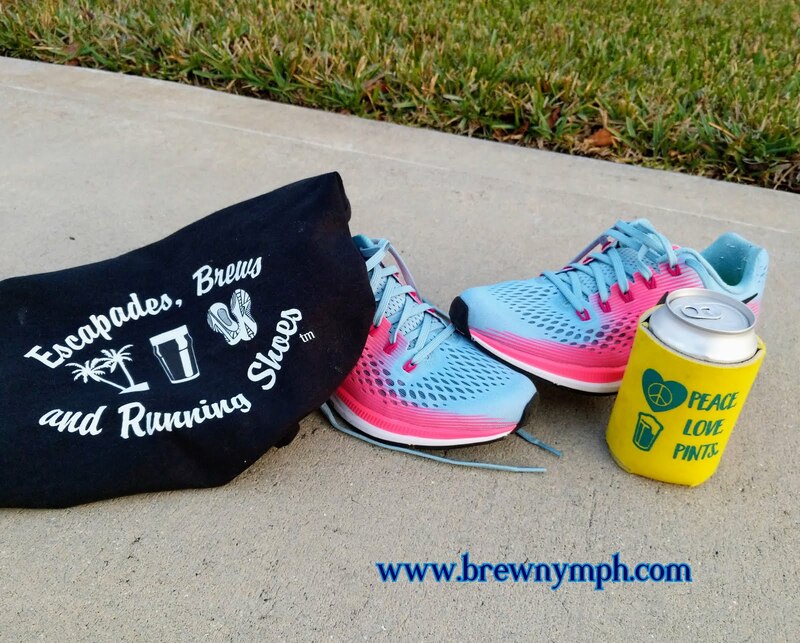 You never know where I'll show up, so I'll see you at the next bar, restaurant, brewery or social event, likely with a beer in hand, or on social media (probably with a beer in hand there, too).